This book tells of the design, development and operational careers of three of Britain’s finest post-war aeronautical products. 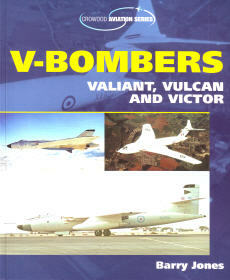 The Vickers-Armstrongs Valiant, Avro Vulcan and Handley Page Victor captured the imagination of a generation, as the ‘V-Force’, for between them they were the British nuclear deterrent in those difficult, early Cold-War days. 192 pgs w/index, SB, 8.50 x 11, b&w and color photographs.